Fangirl Review: Book Review: THE INCREDIBLE THREE AND A HALF SUPERHEROES - Fun for everyone! Book Review: THE INCREDIBLE THREE AND A HALF SUPERHEROES - Fun for everyone! (January 2015) The Incredible Three and a Half Superheroes by Frank Schmeißer and illustrated by Jörg Mühle (April 2015; $19.95; Ages 8 and Up) tells the top secret, totally true adventures of the child superhero team, the Incredible Three and a Half. Most superheroes hide behind masks as they battle against injustice in the world and, for their own protection, their true identities are kept top secret. But for reasons beyond his control, incorrigible sixth grader Sebastian Appleby-Krumble is forced to write down his exploits as part of the superhero team the Incredible Three and a Half. The Incredible Three and a Half Superheroes is a humorous, behind-the-scenes tale of the action-packed adventures of Sebastian, otherwise known as the Brain, and his friends Barbara “Action Barbie” Bakewell, Martin “the Chameleon” Koslowski, and Martin’s imaginary friend Dickie, “the Chicken.” Young readers will find out why Aunt Boadicea’s birthday ended in disaster; why Dolittle, the class hamster, wound up wearing camouflage; and how Sebastian was almost arrested while wearing a giraffe costume. Most importantly, they will discover why everyone must protect the secret identities of the Incredible Three and a Half to save the world from terrible danger! About the Author: Frank Schmeißer lives in Cologne, Germany and is the author of several children’s books in German. Superheroes is his first book published in English. Schmeißer enjoys reading printed books rather than digital ones, although ever since several of his books sunk while he read them in the bathtub, he would rather listen to audio books there. If he had a superpower, he would want it to be endless patience. About the Illustrator: Jörg Mühle studied at the Offenbach University of Art and Design and the École Nationale Supérieure des Arts Décoratifs in Paris. Since 2000, he has worked as a freelance illustrator. His hobbies include listening to music, reading, horses, and playing the recorder. My Thoughts: I recently had the chance to check this book out. I must say that it was a fun quick read. It was filled with great illustrations that only added to the story though I must admit that when I would flip to the next page and see the picture I could not help but stare at the picture and try to figure out what was going on. My eyes would constantly stray to the picture and I had to force myself to read the text and I always ended up giggling at the picture once I knew the premise behind it. 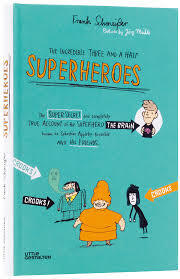 The book explores the trials and tribulations of the three and a half superheroes and I know you are wondering about the half but you have to read the book to understand it. We get to read about the main character, Sebastian, who is faced with trying to save his favorite teacher from being fired as well as his dignity when dealing with a mean great Aunt. The book is well written and and easy to read for the audience. It reminds me a bit of Diary of a Wimpy Kid and if you liked those books then you will like this book. Frankly it could easily be made into a movie or television show. My only concern with the book was that there was a bit too much cursing for my tastes. Overall it is a great book to read for the aspiring superhero.